Till now all I have done is talk about the benefits of online education; all that it gives us for less money. All we can acquire by just sitting at the ease of our houses. But as we all know nothing comes without a disadvantage. If something gives you benefits and comfort, it must somewhere have something that is not that beneficial and can be a little bit hurting. Everything has a cost to it. So does online education. One major drawback in online education is the lack of technical skills required to pursue an online degree. Most people are still not that technologically advanced to cope up with the methods that are used to make online education better. I dont mean that all students are not technologically equipped; however ever there still are a large number who lag behind. Even many of the lecturers and administration people themselves find difficulty in operating the programs to teach or monitor the students. The tutors, especially, have had acquired their degree through traditional means and are mostly not very well versed with the gadgets. Secondly, the most important thing required to student online is a computer and internet connection. However people in regional and far flung areas still dont have access to this commodity. It is quiet expensive for them to purchase a computer. In one place where online education helps students from different areas meet and study together, there on the same time it creates a difficulty where a student cannot consult or discuss a technical problem occurred to him as he may not find anyone from his area. The cost of an online degree is not always very low as thought by students. Some degrees may cost much more than if they were taken traditionally due to the cost of the multimedia accessories and materials involved in the syllabus. These costs may even leave behind the costs of accommodation and travel in local education. Online education sometimes becomes very difficult to maintain. One of the reasons why a student moves towards online education is lack of time. He finds it difficult to maintain a balance between job and college hours. But even whether studying online you need to devote time in order to get grades and pass courses. At college and school, students have pre arranged time tables. Whereas while studying online you have to set a time table yourself or all your efforts go wasted. Another major disadvantage I'd count is the lack of interaction. Even though students interact with their tutors through online learning systems, however one still cant hear questions and discussions of other students at the time of lecture delivery. However nothing is totally free from disadvantages. Online education also has some. It now depends on the student how he manages everything. 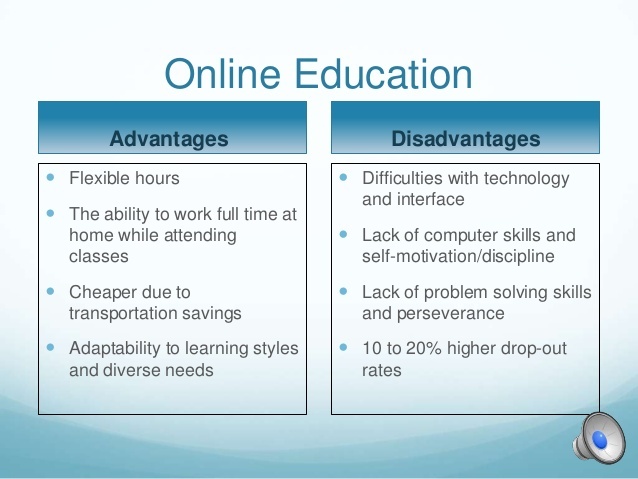 0 Response to "Disadvantages Of Online Education"